Autism is a neurological disorder that affects the way the brain functions. The lifelong developmental disorder affects 1 out of every 68 children and is five times more prevalent in boys. Autism usually affects sensory and motor processing systems of the brain and has varying degrees of severity in different individuals. The two main characteristics of autism, identified in the DSM-V are social communication impairment and restricted interests/repetitive behaviors. There may also be extreme sensitivity to sensory input. 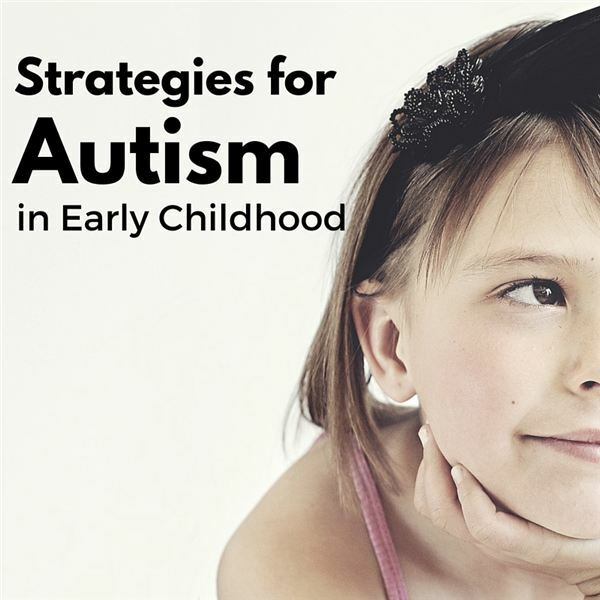 There is no “cure" for autism; however, there are strategies that can help a child with autism function successfully in a preschool classroom with typical peers. Using pictures in various areas of the room for a variety of reasons can help the child anticipate what will happen next. Pictures can also help them make choices and express what they want to communicate to others. Picture Schedule: A picture schedule showing the routine of the day. The child can see what it is time to do in relation to the other times of the day. For example, a child is repeating the phrase, “I’m hungry!" over and over. By using the picture schedule, the teacher can show a picture of a swing above a picture of crackers and juice. This gives a visual cue that first, it is time to play outside and then it is time for snack. As each event takes place, the picture can physically be removed from the board. Picture Exchange Communication System (PECS): This resource will allow users to make and print a wide variety of choices for the child to use to communicate her wants and needs. Offering pictures that show different choices for toys to play with will allow the child to choose whether he wants to play with cars, Legos or puzzles with independence and success. Sign Language: Some children can learn basic signs such as, “More", “All done," “My turn" and “Stop." Social Interaction Cue Cards: Simple cue cards can be used as a visual guideline on how to interact with others. Take pictures of the child along with a stop sign to cue the child to stop after an interaction and wait for the other child to respond. Laminate and use these on a consistent basis to help teach appropriate peer interactions. Social Stories: These stories can be created and printed to help explain appropriate social behaviors. The story gives examples of what to do and when. They are written in first person and in present tense to help the child learn how to act in a specific social situation. Children with autism have atypical behaviors such as hand flapping, screaming or hurting themselves. These behaviors are a way for the child to either avoid something she does not want or access something she does want, but does not have the communication skills to ask for. Setting the room up for success and anticipating changes in routine that can lead to these behaviors takes planning and consistency. Here are some ideas to support structure and routine that may help keep negative behaviors at a minimum. Clear and Well-Defined Areas: Keep centers distinct and labeled, preferably with pictures. Have a visual chart for how many children are allowed in each center as well as a visual waiting list. Set up the environment to encourage peer interaction. Appropriate Materials: Provide simple, familiar materials. Have photos of objects available for choice making and cleanup. Keep materials stored in easy to access containers that are kept in a consistent location. Have enough materials so the child does not have to wait for long periods to access them. Simple Rules: Keep rules simple and concrete. Have directions visually represented with photos and simple language. Modeling how to use materials may be necessary for the child to learn how to play and interact with unfamiliar items. Have clear and simple transitions. Consequences: Consequences must be natural and consistent. Redirect the child from an activity that seems stressful or difficult. Use simple language and photos to help the child understand the unwanted behavior and to show the preferred behavior. A child with autism hears and sees the world around him in a different way than his typical peers do. Many types of sensory input such as fluorescent lighting or noise-level can cause extreme distress in a child with autism. Calming strategies: Provide a soft, quiet area for the child to go when he is feeling overwhelmed. Turn lights down and provide a preferred object to comfort the child. Sometimes slow, soft music may calm a child. A stretchy snuggle blanket can help a child regulate their senses when he is feeling overwhelmed. Weighted objects: Heavy blankets or the weight of a heavy ball or other object in the child’s lap can help him regain composure. Sensory objects: Sensory balls, textured materials (such as a carpet sample book), a plastic bag filled with gel or vibrating toys can comfort a child with autism. Always have something available that is familiar to the child to use to comfort him in times of stress. Always prepare the classroom in a way that respects and supports a child with autism. Using these strategies is a good starting point to set up the classroom for success. Willis, C. (2006). Teaching Young Children with Autism. Beltsville, MD. Gryphon House, Inc. Frost, L. & Bondy, A. (1994). The Picture Exchange Communication System. Focus on Autism and Other Developmental Disabilities. Hammill Institute on Disabilities.